This time, CRR Tripp Shenton hopes to actually get to Boston. Last year, though he had a qualifying time, Shenton ended up missing the BAA-imposed cut-off time by just one second! He qualified for Boston by running the Shamrock Marathon last weekend in Virginia Beach in a very commendable 3:36:21, especially given the race conditions (20 mph sustained winds). Tim Hodson, son of CRR Robert Hodson, recently ran a 3:09:51 at the Canton, Ohio, marathon, finishing 7th overall. This time qualifies him for the Boston Marathon. PRBQ—What could be better at age 53! And no four-leaf clover required. That’s probably what CRR Tripp Shenton is feeling like today. 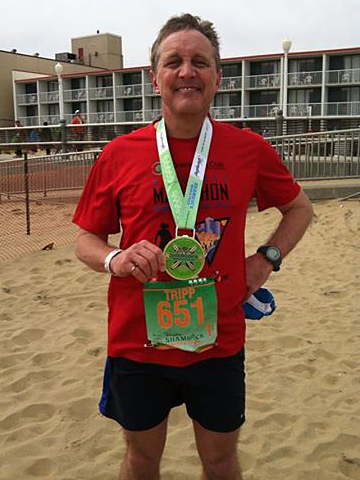 He ran the Yeungling Shamrock Marathon, held today in Virginia Beach, in a personal best (PR) of 3:28:59. 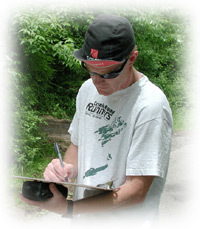 That time was also a Boston-qualifier (BQ) for Shenton, a professor of civil engineering at the University of Delaware. He finished among the top 10 percent of the field, placing 277th out of 2788 finishers. Plus, what could be cooler than having your name printed right above your race number?